The Met’s acclaimed new production of Bizet’s The Pearl Fishers (Les Pêcheurs de Perles), a rarity by the composer of Carmen that has not been staged by the company in a century, comes to THIRTEEN’S Great Performances at the Met for the first time Sunday, May 22 at 12 p.m. on PBS(Check local listings). In New York, THIRTEEN will air the opera on Sunday, May 29 at 12:30 p.m. Conducted by Gianandrea Noseda and directed by Penny Woolcock, Bizet’s sweeping romance tells the story of a beautiful Hindu priestess pursued by rival pearl divers competing for her hand. Diana Damrau leads the cast as the priestess Leïla, opposite Matthew Polenzani as Nadir, Mariusz Kwiecien as Zurga, and Nicolas Testé as the high priest Nourabad. The 1863 opera premiered at the Théâtre Lyrique in Paris, 1863. 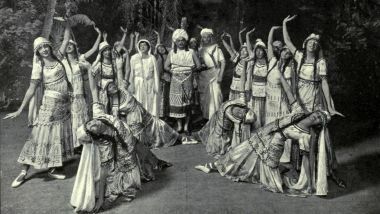 Critics at the time were not especially enthused but the audience was swept up in the ravishing score tinged with the allure of a mythical South Asian setting. The drama itself remains within the conventional standards of the day, with a love triangle complicated by the true friendship of the two men involved in it. The opera was originally set in Ceylon (modern Sri Lanka) in non-historic “ancient times,” signifying an exotic land with a mythical and romantic aura. The Met’s new production places the action in an unspecified locale in the Far East. In addition to its striking lyrical expression, the score is filled with surprising and delightful features throughout. The important role of the chorus is evident from the opening number, with its extraordinarily beautiful middle section for men’s voices. The orchestral writing is equally sophisticated, especially in the subtle touches of instrumentation. But it is the remarkable solos and ensembles that have made the opera impossible to forget, chief among them the celebrated duet for the tenor and baritone, “Au fond du temple saint.” Its abundant melody miraculously encompasses a profusion of diverse sentiment, from religious ecstasy to exalted friendship to sadness and loss. Before the current 2015–16 season, The Pearl Fishers had only received four performances at the Met. Three of them, in 1916, starred Enrico Caruso and Giuseppe De Luca. Soprano Patricia Racette hosts the broadcast. The Pearl Fishers was originally seen live in movie theaters on January 16 as part of the groundbreaking The Met: Live in HD series, which transmits live performances to more than 2,000 movie theaters and performing arts centers in over 70 countries around the world. The Live in HD series has reached a record-breaking 19 million viewers since its inception in 2006. For the Met, Matthew Diamond directs the telecast. Jay David Saks is Music Producer. Mia Bongiovanni and Elena Park are Supervising Producers, and Louisa Briccetti and Victoria Warivonchik are Producers. Peter Gelb is Executive Producer. For Great Performances, Bill O’Donnell is Series Producer; David Horn is Executive Producer.